You may not readily recognize this man, who has announced his retirement ? For most part, the city of Chennai experiences hot weather ~ and one most sought visitor on the streets is Metro water lorry. There has been some heartwarming news that this summer may be comfortable for the city in terms of water supply. More Krishna water is on its way to the city, which is struggling to boost its water resources. Reports state that on last Friday, the State’s entry point of the Kandaleru Poondi canal in Uthukottai, Tiruvallur district, received 407 cusecs of Krishna water. Poondi reservoir, which stores Krishna water, has touched half of its storage capacity. Officials of the WRD said Kandaleru reservoir is now receiving inflow from Somasila reservoir located upstream. .. .. summer is almost there ! ~ for water crisis, we are not alone ! – those of us watching Cricket do well know of the conditions in South Africa, where day Zero threat looms large ! South African cities are reeling under extreme water crisis. At Capetown, in the late 1970s, the waterway was dammed to create the biggest reservoir in South Africa’s Western Cape. Behind the thick walls of the Theewaterskloof dam lay the capacity to hold 480 million cubic metres of water, nearly half of Cape Town’s water supply. The local government now says that the taps will be turned off on 11 May. At that point, people will only be able to collect a daily allowance of 25 litres from 149 points around the city, marshalled by the police and military. Cape Town is a coastal city in South Africa and the second-most populous urban area in South Africa after Johannesburg. It is also the capital and primate city of the Western Cape province. As the seat of the Parliament of South Africa, it is also the legislative capital of the country. The city is famous for its harbour, for its natural setting in the Cape Floristic Region, and for such well-known landmarks as Table Mountain and Cape Point. Located on the shore of Table Bay, Cape Town, as the oldest urban area in South Africa, was first developed by the Dutch East India Company (VOC) as a victualling (supply) station for Dutch ships sailing to East Africa, India, and the Far East. South Africa’s second-largest city after Johannesburg, Cape Town was not an obvious candidate for that dubious distinction. In 2014, its dams were flush with rainwater and its water-conservation strategy was award-winning. Then came the worst drought South Africa had seen in a century, lasting three whole years. Now, the Theewaterskloof Dam, the city’s main reservoir, is at just 13 percent of capacity ~ though a great threat, they claim that at the moment, Day Zero is still avoidable. Cape Town has already cut its daily water consumption significantly by lowering pipe pressure and instructing residents to conserve water, threatening fines for those who exceed the limit and publicizing household water consumption so people can find out if their neighbors are overusing. Conscientious Capetonians are currently taking measures such as bathing and doing laundry less often, limiting showers to two minutes, and recycling the water they use to wash food, do dishes, or brush their teeth as gray water for flushing their toilets. Elsewhere Australia thrashed England in T20 International. Needing 156, an outstanding allround display by Glenn Maxwell drove Australia to two wins from as many matches in the T20 triangular series, after England squandered a powerful start to their innings having been sent in by the hosts' stand-in captain David Warner. The man at the start, Doug Bollinger, the rumbustious New South Wales fast bowler, has chosen to retire at the age of 36 as the Blues look towards more youthful pace options for the resumption of the Sheffield Shield later this week. 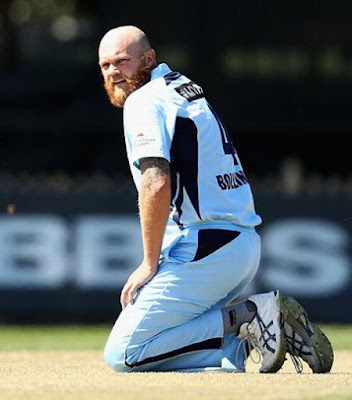 Having first turned out for his state as far back as 2002-03, Bollinger played 12 Tests and 39 ODIs for Australia, with handsome records in each format. In case, you are still unable to recognize, recall – he is a CSK player and danced with Katy Perry at Nandanam in that opening ceremony in 2012. In South Africa, Smriti Mandhana's 98-ball 84 and fast bowlers Jhulan Goswami and Shikha Pandey's combined returns of 7 for 47 in 17.2 overs, helped India open the new cycle of their ICC Women's Championship campaign with a thumping 88-run win against South Africa in the first ODI in Kimberley. Going into the South Africa tour, Jhulan Goswami was only five wickets away from 200 ODI scalps in women's cricket. But a wrist injury sustained a day before the start of the senior women's domestic season, on December 6 last year, briefly cast a doubt over the feat. After bagging 4 for 24 in the first ODI in Kimberley though, Goswami accomplished the task and has become the first woman bowler to take 200 wickets in ODIs. In the 2nd ODI, Opener Smriti Mandhana smashed a career-best 135, and seamer Jhulan Goswami became the first bowler to 200 ODI wickets in women's cricket, as India soared to a series win, with one match remaining, in Kimberley. In pursuit of 303, South Africa folded for 124, of which opener Lizelle Lee made 73 at a strike-rate of nearly 100. India's spinners - legspinner Poonam Yadav, offspinner Deepti Sharma, and left-arm spinner Rajeshwari Gayakwad - returned combined figures of 19.5-2-72-8 to tear up the chase. India's veteran pacer Jhulan Goswami on Wednesday added another feather to her illustrious cap by becoming the first female cricketer to take 200 ODI wickets. The 35-year-old, playing her 166th ODI, dismissed opener Laura Wolvaardt for her 200th scalp. Interestingly, the first male cricketer to pick 200 ODI wickets, was also an Indian -- the great Kapil Dev. In May 2017, Goswami became the highest wicket-taker in women's ODIs, eclipsing the decade-long record held by Australian Cathryn Fitzpatrick. Aiden Markram captained South Africa in place of an injured Faf du Plessis in the second match of the six-match ODI series against India and yesterday too felt the heat at Captown as Pretoria folded cheaply. Although South Africa had earmarked Markram as a future captain, Markram would've hardly expected to take the reigns so early in his career, albeit temporarily. Aged just 23, Markram is the second-youngest player to captain South Africa in ODIs. The one with least experience was Terrence Duffin who captained Zimbabwe in 2nd ODI against Kenya at Bulawayo, Feb 26 2006. He had played a solitary ODI earlier. Ben Stokes' hopes of avoiding the spotlight when he attends court next week appear to have been dashed. ESPNcricinfo reports that Stokes, who is set to appear in Bristol Magistrates Court on February 13 to answer charges of affray, requested permission to leave the court via a back door in the hope of avoiding an anticipated media scrum. That permission has been denied, however, meaning Stokes will have to enter and leave the court through the front door. Stokes was arrested following an incident outside a bar in the city on September 25. Two other men, Ryan Hale and Ryan Ali, have also been called to attend court on the same day in connection to the incident. Stokes has intimated that he will plead not guilty. At Capetown, Virat Kohli played his ODI career's longest ODI innings, 159 balls, in the third ODI in Cape Town. Virat Kohli ensured India will have some share of the silverware as he took them to unassailable 3-0 lead in the ODI series. 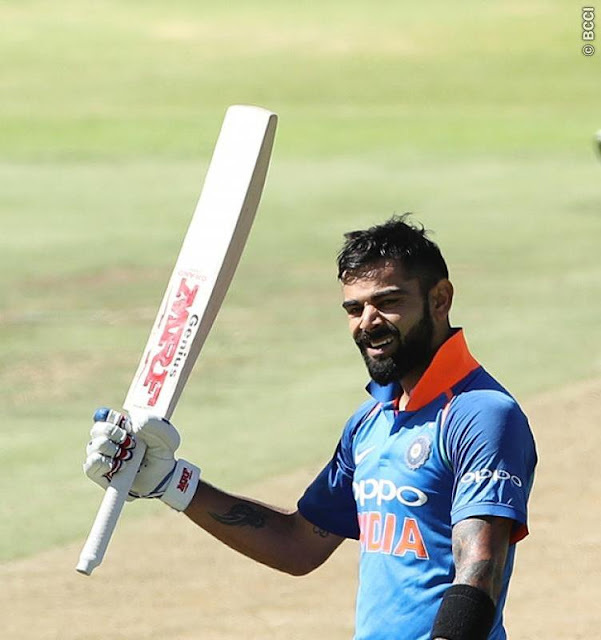 Kohli scored his second century in three matches, his third on India's tour of South Africa and more than half India's total of 303 before his bowlers did the rest. South Africa's line-up, riddled with inexperience, was again spun out by Kuldeep Yadav and Yuzvendra Chahal. With eight wickets between them, the pair took their series tally to 21. They have claimed but all but seven of the South African wickets across three matches. Their wickets at Newlands came at a cost just 69 runs, and through the series, they have conceded 190 runs and taken their wickets at an average of 9.05.